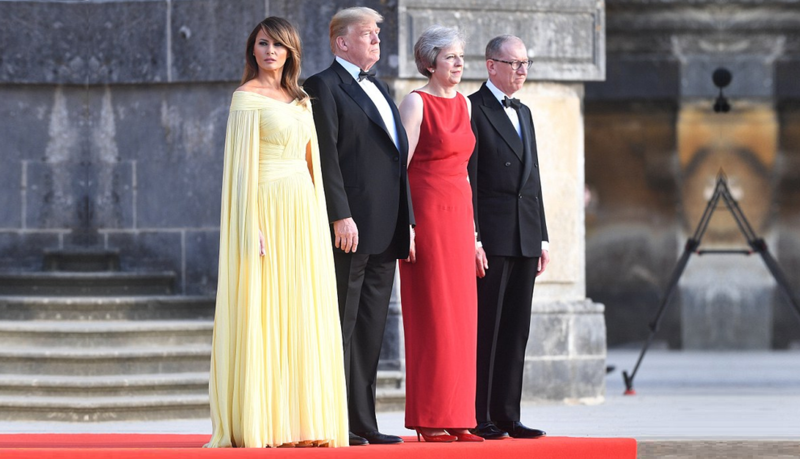 First Lady Melania Trump was sure not to be outclassed by the British Royals, giving them a run for their money as she appeared in a long yellow dress (a dramatically sweeping Grecian-goddess ball-gown) which was widely complimented on social media. The pictures were taken at the black tie dinner that UK Prime Minister Theresa May hosted in the First Couple’s honor at Blenheim Palace. Ms May can be seen with her husband Philip May. The magnificent Blenheim Palace in Oxfordshire was the setting for a dinner with leading business figures and various UK politicians. The setting of Blenheim was chosen as it is the birthplace of Winston Churchill, a figure Mr Trump greatly admires. The evening began with a military ceremony in the Great Court where bands of the Scotch, Irish and Welsh guards played for the US President. At the tones of Liberty Fanfare, Amazing Grace and the National Emblem The First Couple was sat down for dinner with some 100 business leaders from the worlds of financial services, travel, creative sector, food and drink sector, engineering, tech, infrastructure, pharma and defence. The UK is still hoping for a good trade deal with the US now that their Brexit negotiations have proven a ‘tad’ tricky. During dinner the Countess of Wessex's Orchestra performed "a series of classic British and American hits" whilst at the end the Royal regiment of Scotland "piped the President out at the end." Today, US President Donald Trump will join UK Prime Minister May to watch a military exercise at the Royal Military Academy at Sandhurst after which the pair will meet up for bilateral talks at the Prime Minister’s country retreat at Chequers (which was the setting for a Brexit meeting with the tory party last week, see our related coverage). This afternoon, the US First Couple is expected for tea with the UK Queen Elizabeth at Windsor Castle. From there, they will travel to Scotland for the weekend. Even exceeds Jackie-O for Style and Grace.